First Appearance: Web of Spider-Man (vol. 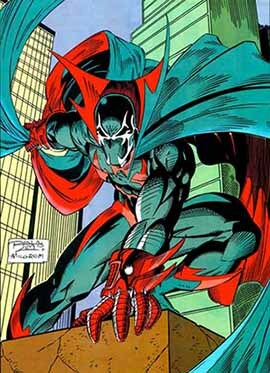 1) #97 (Feb. 1993): "Opening Volley"
The Marvel super-hero "Nightwatch" has a costume and origin which is very similar to that of the popular Image Comics superhero Spawn. 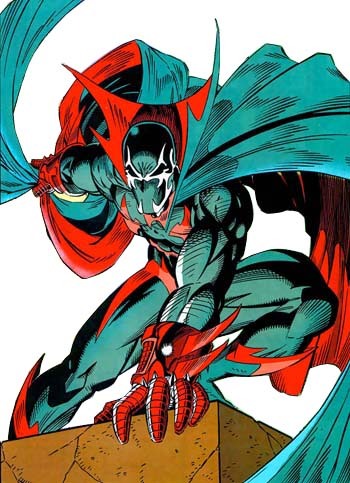 Nightwatch is generally regarded as attempt by Marvel to copy Spawn (while being different enough to avoid legal entanglements) and capitalize on Spawn's popularity. Spider-Man Unlimited (vol. 1) #2 (Aug. 1993): "Maximum Carnage, Part 14 of 14: The Hatred, the Horror and the Hero"
Spider-Man Unlimited (vol. 1) #14 (Dec. 1996): "Game's End"
Web of Spider-Man (vol. 1) #98 (Mar. 1993): "Uneasy Alliances..."
Web of Spider-Man (vol. 1) #103 (Aug. 1993): "Sin City"
Web of Spider-Man Annual (vol. 1) #9 (1993): "The Origin of the Cadre"
Web of Spider-Man Annual (vol. 1) #10 (1994): "Pin-Up section"